Summer Shakespeare under the stars? 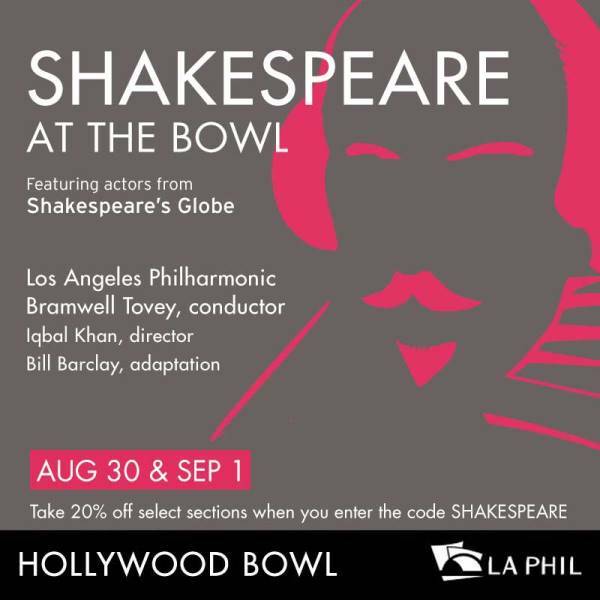 In Hollywood that can only mean that it’s time for Shakespeare at the Bowl — two performances only, August 30 and September 1, at the Hollywood Bowl. On these joyous evenings, actors from Shakespeare’s Globe Theatre will perform classic scenes from the playwright’s best works, directed by Iqbal Khan, adapted by the Globe’s music director, Bill Barclay. Our friends at the Bowl have also got a great deal for you on tickets. Get 20% off with the exclusive discount code SHAKESPEARE! Tickets are available now at Shakespeare at the Bowl. Hi, I would really love to volunteer in any capacity. I am Shakespeare enthusiast of over 30 years and would love to be a part of this. I have sent 3-4 letters on the Shakespeare website but have not heard back. Is there another address I should use? I live in Culver City and am willing to do whatever needs to be done. All the best to you and we’re so glad you’re a lover of Shakespeare!